Some people hate Twitter chats. I am not one of those people, but I'm always interested to understand WHY people love or hate things. The complaint about Twitter chats is often that they are one-hour long echo chambers about the same topics that have been discussed over and over. I have benefited greatly from a huge variety of Twitter chats. When I first joined the initially overwhelming stream of discussion topics tied to #edchat hashtags, I liked the questioning format of: How do you define x in education? How do you use x in your teaching? What are the problems with x in education? What are some resources to learn more about x? I connected with interesting people, got to share stories from my classroom and was inspired to try new things. As I become more comfortable with online collaboration, 140 characters at a time, I want to push the envelope (like my friends Sean "#2pencilchat" Farnum, Doug "#weirded" Robertson and Ross "#totallyrossome" LeBrun). A few weeks ago, the incredible team at #cdnedchat (who l am thrilled to be a part of this year) embraced the idea of a virtual escape room, and #eduescape was born. The chat bucked the convention and participants were issued challenges that they had to complete before unlocking the questions about how to create immersive, interactive experiences in their classrooms. 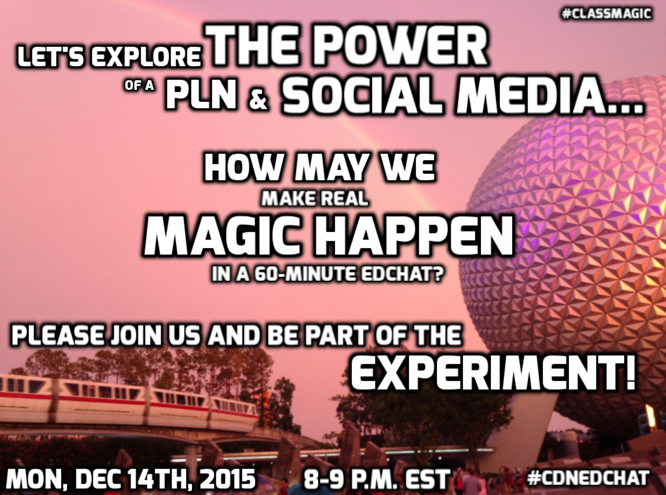 When the other moderators at #cdnedchat invited me to host a chat about my new book, "Creating Classroom Magic: Using Lessons from the Life of Walt Disney to Create an Experimental Prototype Classroom of Tomorrow," I wanted to do something a little different. Because I believe strongly in practicing what I teach, I couldn't write a chat that stuck to the familiar format. Instead, I wondered if participants in a 60 minute chat could, in fact, use the power of social media and a PLN (Professional/Personal Learning Network), to make magic. Rather than talking about magic, we're going to try to make it. My hope is that we will be able to make a real change to someone in our hour together. One of the recurring themes in edchat conversations is how wonderful it is to be a "connected educator" on Twitter and how powerful social media is. I want to test those assertions. How powerful can our voices be? Let's do something unexpected. Creating magic is about surprising someone, giving them more than they expected and filling them with wonder. How may we do that using Twitter? I am going to try to create as much of a collaborative learning space as possible. If you have suggestions on how to make this better, please share them! The ideas and stories that engage us might be different. I'm not sure what the result(s) of this chat may be, but want to make sure that everyone feels good about what we accomplish together! You will likely become engaged with other participants and want to continue the conversation, you can do so in the chat with the hashtag #cdnedchat, in DMs (direct messages) and/or long after the chat has finished. If you break off and have a conversation or planning session in DMs, please come back to the chat and share what you've planned! It's totally fine if you have to catch up once the hour is done! We'll monitor the hashtag for a while afterwards! Consider bookmarking interesting links that are shared during the chat so you can come back later and read further. I hope that we can be productive, hopeful and have an impact in one hour. I know that we can do all of those things in a day, a week, a month, a year or a lifetime. I hope that you'll find something in this hour that you want to pursue well beyond it. If you follow me on Twitter, you may notice that I often post videos, stories and pictures with the hashtag #DailyCry or a description of "all the feels" or the goosebumps said link produced in me. I search for and post things like this because I believe, despite everything, that humans are good. Watching the news, or even scrolling through a Facebook feed, it can be hard to remember this. In addition to exploring tough issues, I think we need to embrace and share the stories of people doing good, and, as Mr. Rogers said, "look for the helpers." Safyre Terry now has boxes filled with Christmas cards. This young girl was badly burned and lost her family in a house fire caused by arson. She lives with her aunt, who shared a photo of Safyre, by a Christmas card tree, and a wish that the tree be filled up. A Florida McDonald's Drive-Thru had a 250 person streak of "paying it forward." Sports Illustrated's High School Athlete of the Month is a big brother that led his community in fundraising to create an inclusive playground, so that his little brother, who has Cerebral Palsy, could play with his friends. How did he fundraise? He carried his brother on his back for two treks (totalling nearly 100 miles) he calls the "Cerebral Palsy Swagger." Students are wearing orange to support a schoolmate with cancer who was being bullied online. Residents of a drop in and rehab centre, who are homeless, donated money to the Children's Wish Foundation. The money was raised by collecting and recycling cans. High school students practiced empathy in a project called, "Walk a Mile in Her Hijab" where students who don't normally wear a hijab spent a day wearing them. A grade 8 student made a video board to help his friend communicate. Because he was struck by lightning, his friend was unable to communicate effectively. This young inventor created a device ethat his friend can control by moving his head to answer "yes" and "no." This has been an exciting week in Canada, as the newcomers (Syrian refugess) that are sponsored privately and by our government begin to arrive to their new homes. Teach Kids News has an article about the newcomers to Canada (this is a great website that features articles written in kid-friendly language, and has curriculum connections for every news story. A children's choir in Ottawa (my hometown) learned and performed a historical Arabic song to welcome newcomers. Some of the above stories have gone viral. All of them, and so many more, deserve to. Who would benefit from our help? Let's figure it out together? Edvengers (yes, I went there) Assemble! 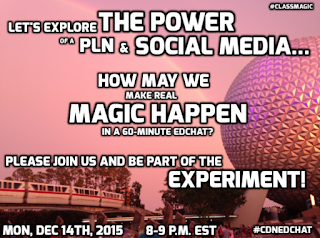 I can't wait to hear YOUR stories and help make some magic in tonight's #cdnedchat. My brother, Charlie (this post is dedicated to him, the day after his birthday! Happy Birthday, Charlie!) and his partner, Ashton introduced me to Escape Rooms nearly a year ago. We were in New York City for New Year's 2015 and they insisted that I come play an immersive game with them. We spent an hour locked in a tiny apartment with a family we'd never met before and, together, solved riddles, puzzles and challenges to get enough keys to unlock a lockbox to let us out of the room. Tweeting about #eduescape has led to connecting with more educators who are keen to experiment with their students to use Escape Rooms in education. In preparing to talk to two Ottawa educators about their developing #eduescape plans, I put my thoughts down. Below and linked is a summary of my research, thinking and development of how to use Escape Rooms in Education. There is a link for a Planning Template that you can use, as well as other resources to explore. I am so excited about this innovative teaching method. If I can do anything to help or support you as you experiment and prototype Escape Rooms in your classroom, let me know! In education, we can use the concept of Escape Rooms in a number of ways to excite learners and help develop their skills, teaching them content through immersive, engaging play. Why Would You Want to Use Escape Rooms in Education? In Escape Rooms, students use gameful attitudes and teamwork to solve riddles, challenges and problems. Curriculum Tie-Ins: the sky’s the limit! You can teach or practice any content through the storyline and/or challenges you incorporate in your Escape Room. There are obvious storylines from history and current events that can be used. Challenges can incorporate math, science, technology, art, reading, writing, finances, literature, music, geography, physical activity and other disciplines. set the purpose of the challenges - what are players trying to do? how can the challenges be better in the future? how can players work better in the future? Do you need players to solve challenges in a certain order? How many players are needed to solve each challenge? What guidelines and rules do you need to set? do players have to take turns? Will you incorporate a penalty for any hints? What is your success/escape rate? How can we prove that this is learning? What are the Success Criteria/Expectations? create an interactive, immersive adventure with multiple challenges that addresses X standards/expectations? tell a story that players can be a part of through active play? Who are our users? What do they need from us? Set a deadline: when do we want to launch this? Use the ideas above to think about your Escape Room and then fill out the details in this Planning Template. I hosted an #eduescape Twitter chat for #cdnedchat. If you want to see how to fill out the Planning Template, here is the plan for that game: #cdnedchat Escape Room.